In addition to sporting a broad range of different game formats for both team and individual games, the founders of GameBook have developed two formats of their own. Duplicate and Erado are both alterations of or additions to the more traditional game formats. And they were designed to make golf more fun and interesting. Just like GameBook itself. Erado – Saves you from those catastrophes! 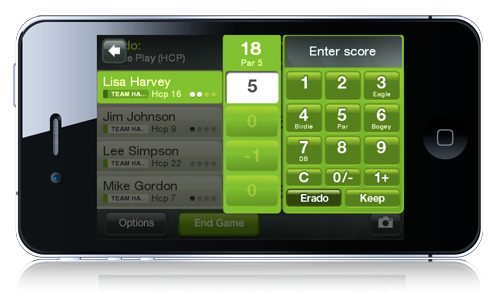 Erado allows you to erase a selected number (up to 4 on an 18-hole round) of bad holes from your total score. Sounds great, doesn’t it? But as always – there’s a catch. The decision to erase must be made before playing the next hole. And the final hole cannot be erased. Simply put: This is your chance to forget about those one or two catastrophes that tend to turn up on every round. Your Erado strategy will be the key to mastering this game format! In Duplicate a random multiplier of 1, 2 or 3 is picked and then applied to the Stableford points earned on each hole. The final hole is always worth double points. This means that you can either earn or loose a whole lot of points on just one hole and change the direction your game is headed. Try it out! 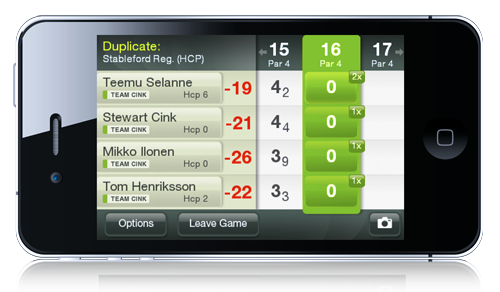 You can also use Duplicate in a scramble and GameBook calculates the scores for you. This sums up the various game formats available on GameBook at the moment. The next one coming up in the near future will be the much asked for match play. The previous parts of our game formats series presented individual game formats and game formats for teams.